Setting off from Leh after 2-3 days of well acclimatizing, we drive to Zingchen and ascend to Ganda La via visiting Rumbak are which is known for Snow Leopard area. 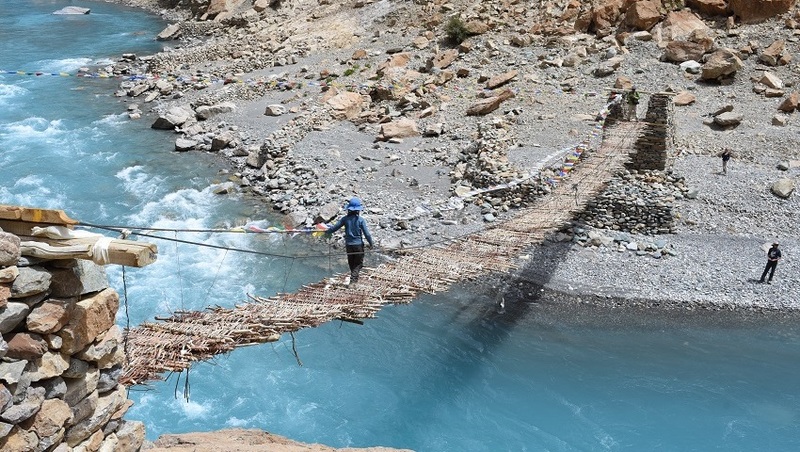 Descending through narrow gorge to Skiu where Markha valley widens up, we follow the Markha River to Nimaling plains. The Markha valley is donimated by Kang Yatse peak. 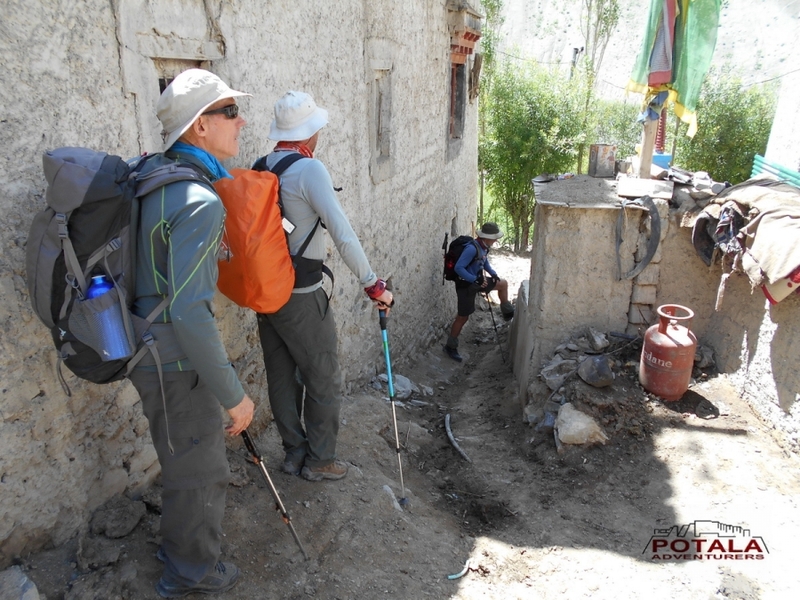 Meeting locals and visiting their house and exploring the region finally steep descent from Kongmaru la to Shang. Where our trek ends. 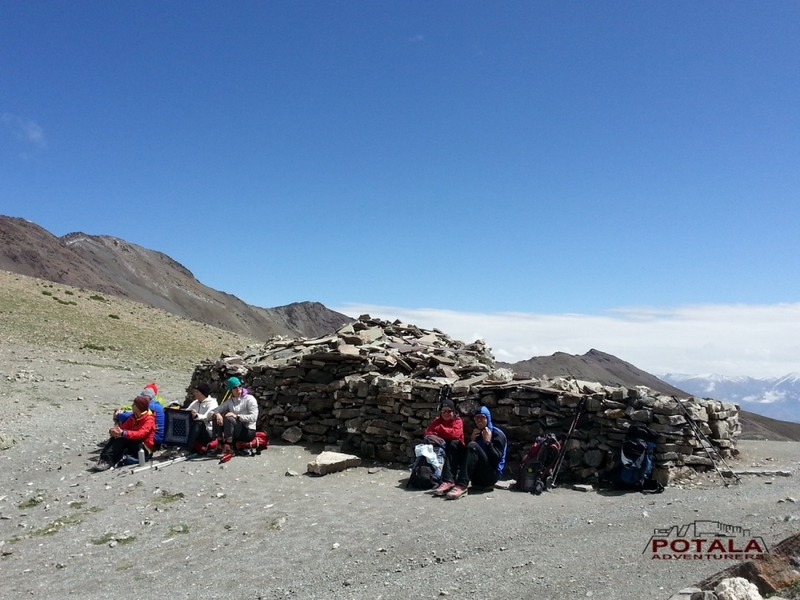 Day 1 Drive Leh – Spituk - Zingchen (3530m), Trek to Rumbak (4050m), Climb Stok La 5 - 6 hrs. 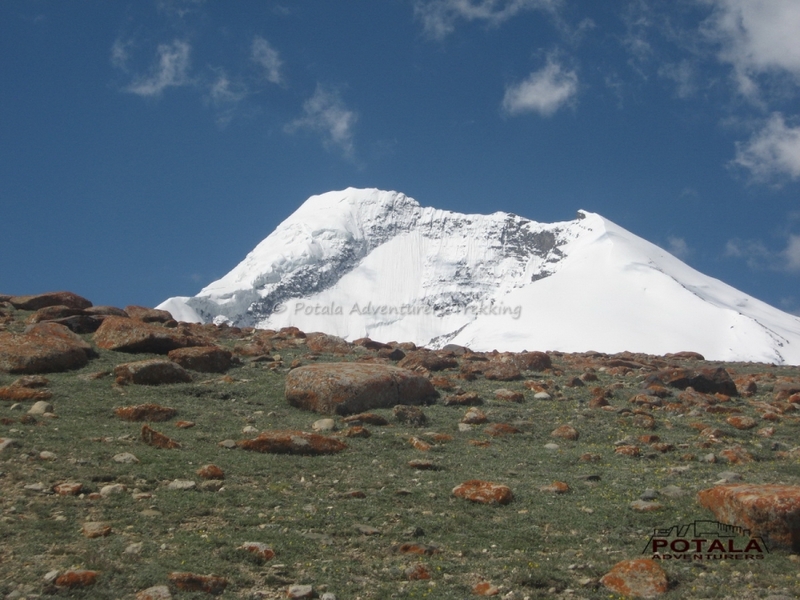 Day 3 Trek to Gandh la (4900m) – Shingo (4060m) – Skiu (3290m). 5 - 6 hrs. 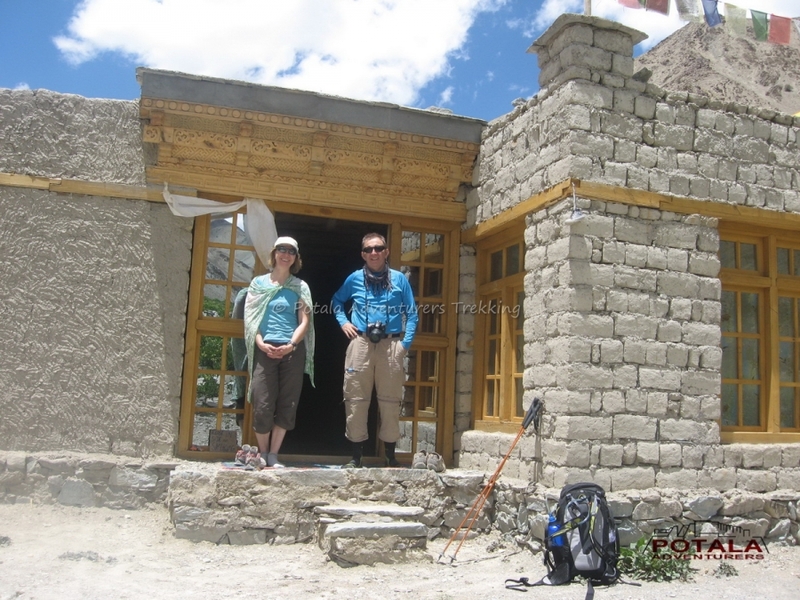 Day 4 Trek to Markha (3710m), 6 -7 hrs. 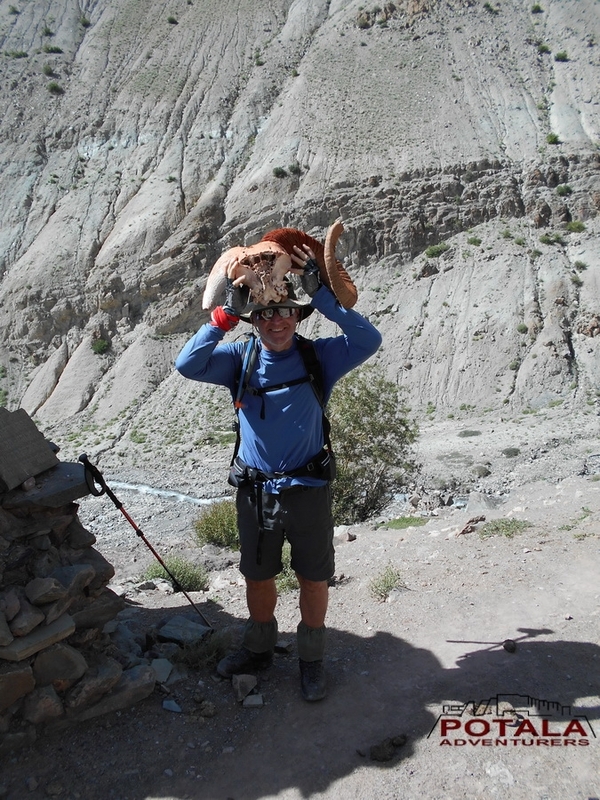 Day 6 Trek to Nimaling (4800m) 5 hrs. 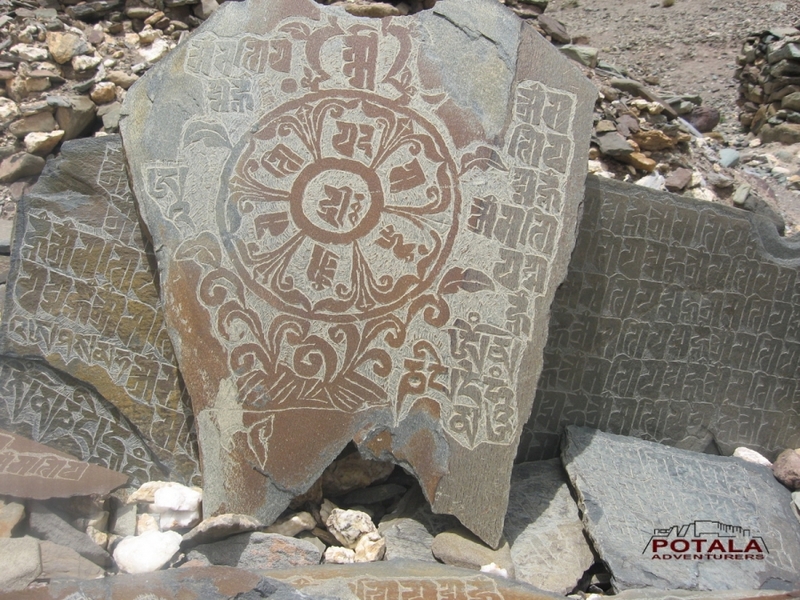 Day 7 Trek to Kongmaru La (5150m) – Chuskirmo. 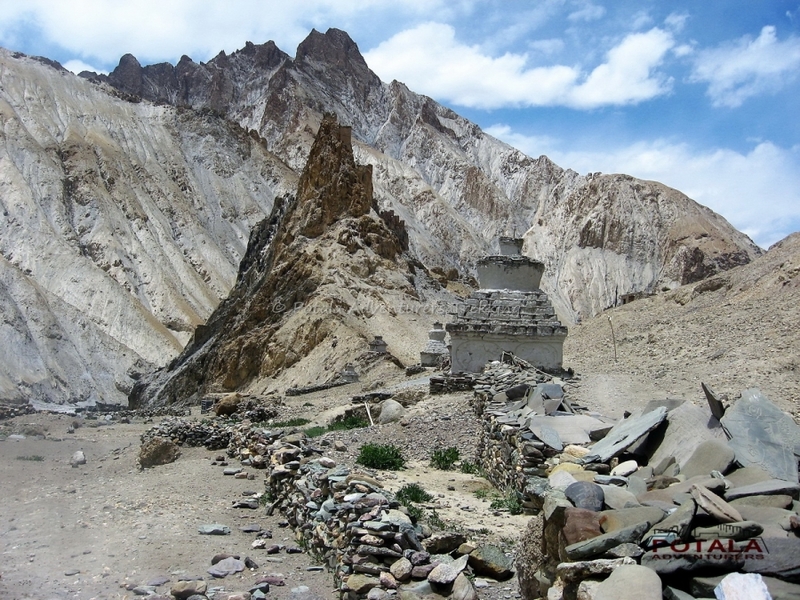 Day 8 Trek to Shang Sumdo (3660m), Drive to Leh. 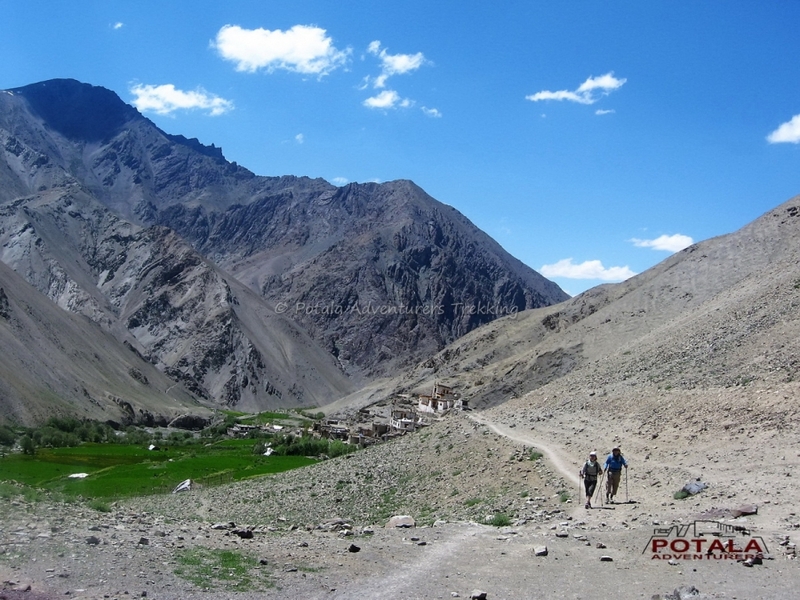 Leaving Leh today after breakfast drive to Spituk which is 7 kms and has a Gelukpa sect monastery built on a hill and has a magnificent view of Indus valley, continue to drive to starting point of trekking at Zingchen, where our mules and horses will be waiting for us. 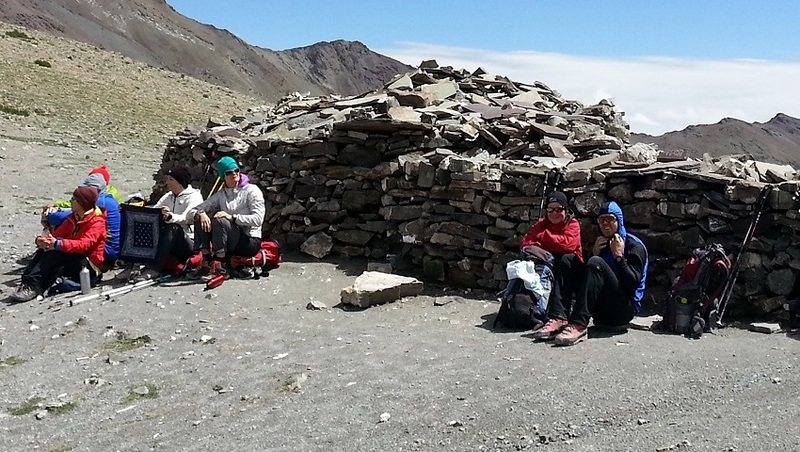 Staff will load luggage as you continue to trek on a clear path. Now easy and gentle walk to Rumbak. Gradual climb to Rumbak on a well-defined trail. 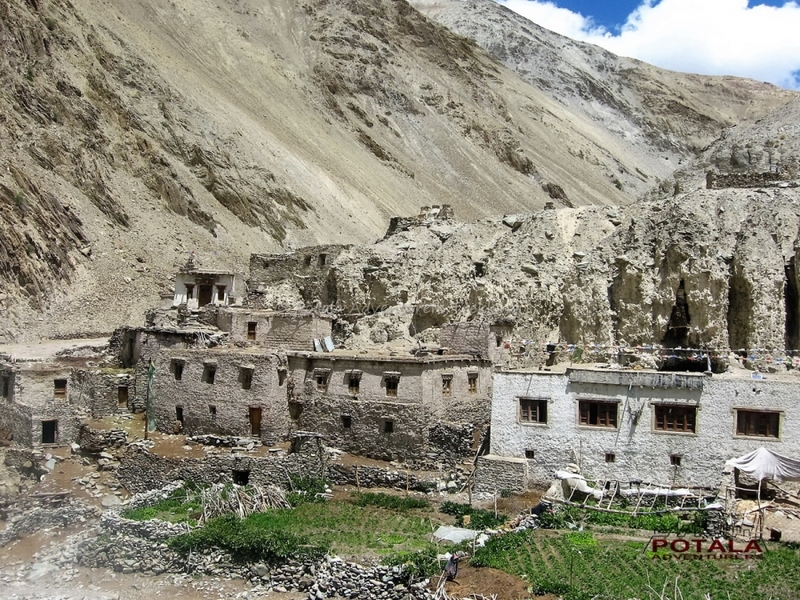 We pass Rumbak village. 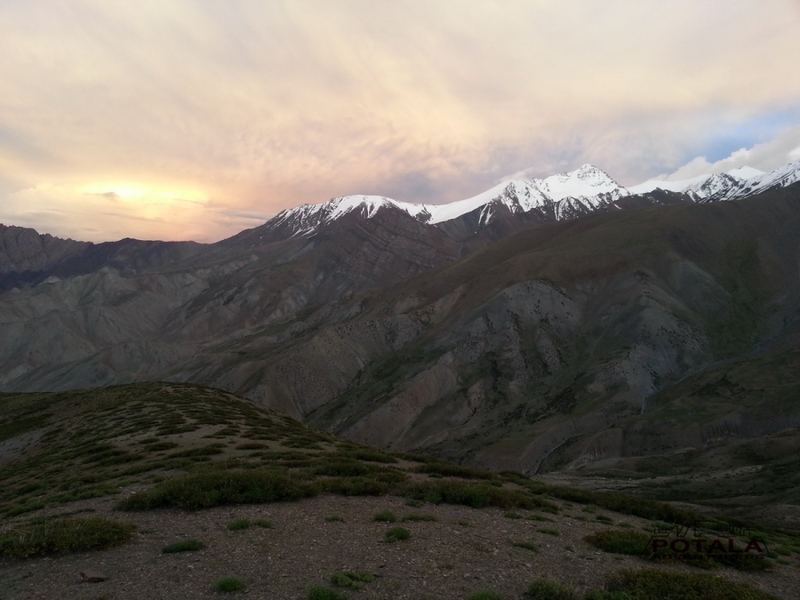 A fabulous view of snow-capped Stok Kangri can be seen. Our camp is short after Rumbak, occasionally wild animal can be seen in Rumbak area. 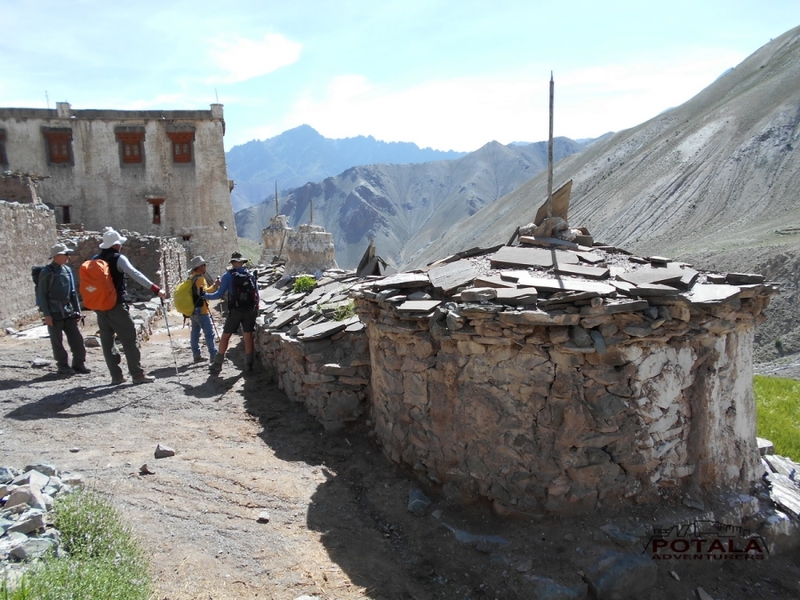 Now we move towards the Rumbak nallah, crossing it walk along the right side leading towards Yurutse. 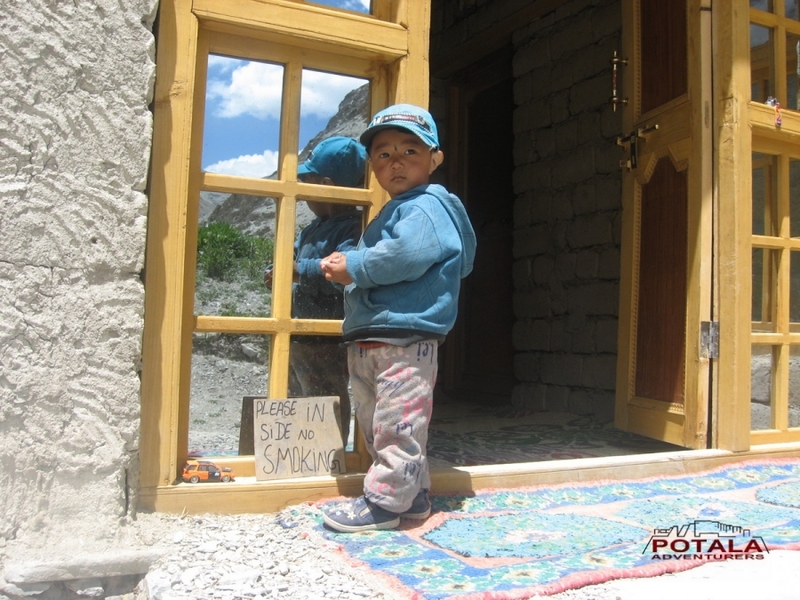 Yurutse has only one house and has a fields of vegetables and barley crop. 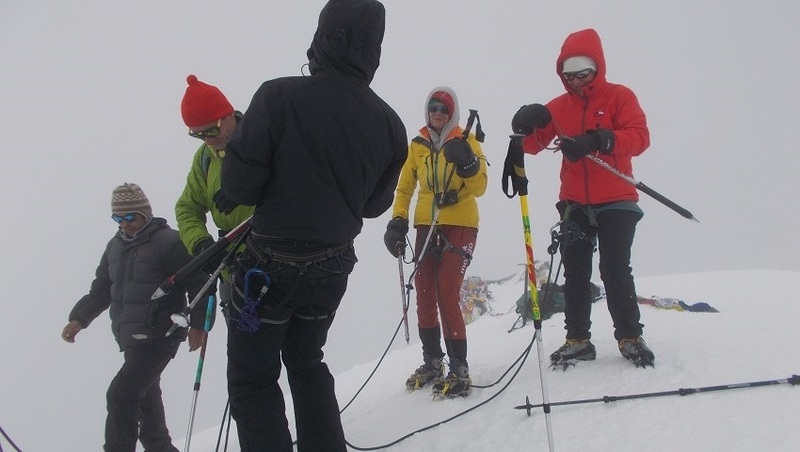 Gradual ascent to Gandha la base at 4500m. Overnight in camp. 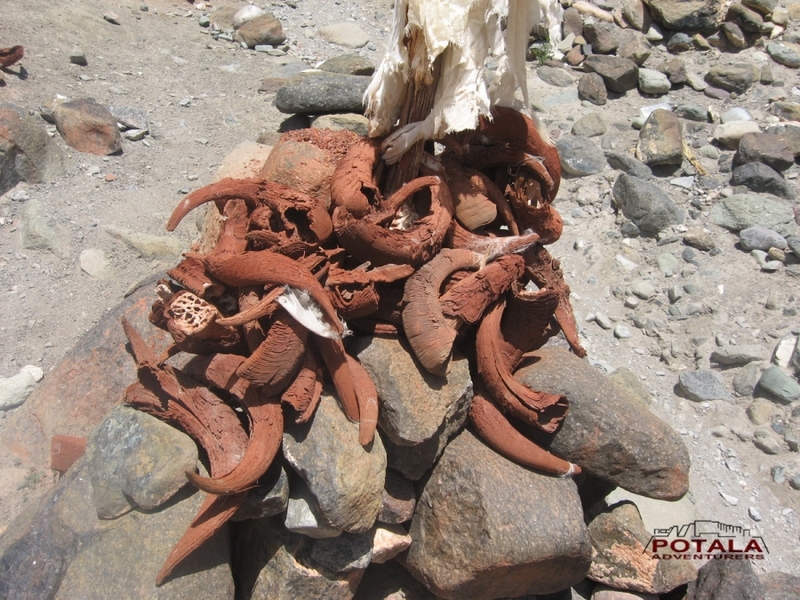 Day 3 Trek to Ganda la (4900m) – Shingo (4060m) – Skiu (3290m). 5 - 6 hrs. 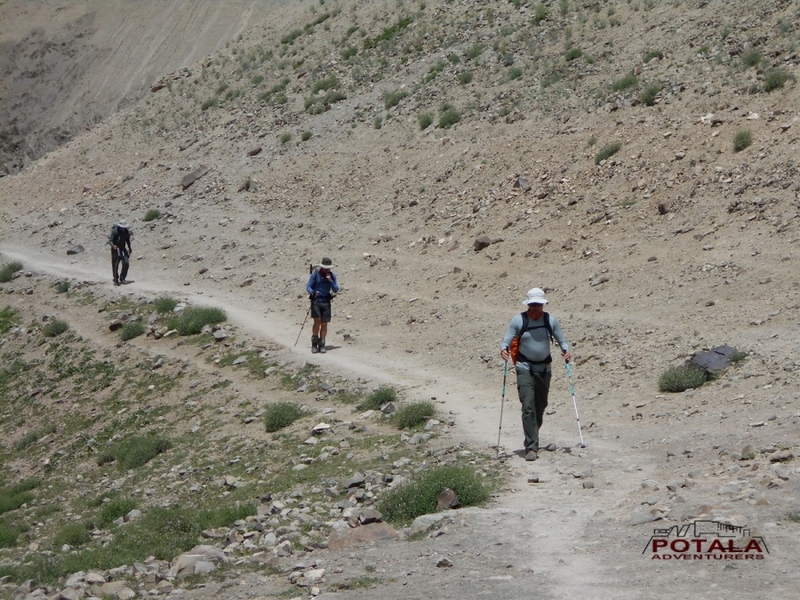 Today after breakfast gradual climb to Ganda la pass 4900m. 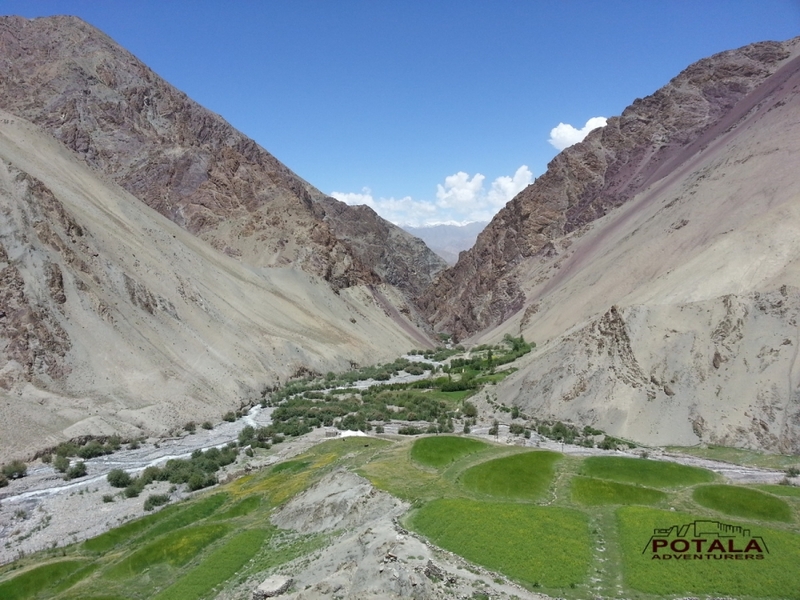 The views from top Zanskar range to the south and Ladakh range to the north and Karakoram beyond Ladakh range. Soon after long descent to Shingo 4060m and then on a narrow and stunning gorge leading towards Skiu and the valley opens out. 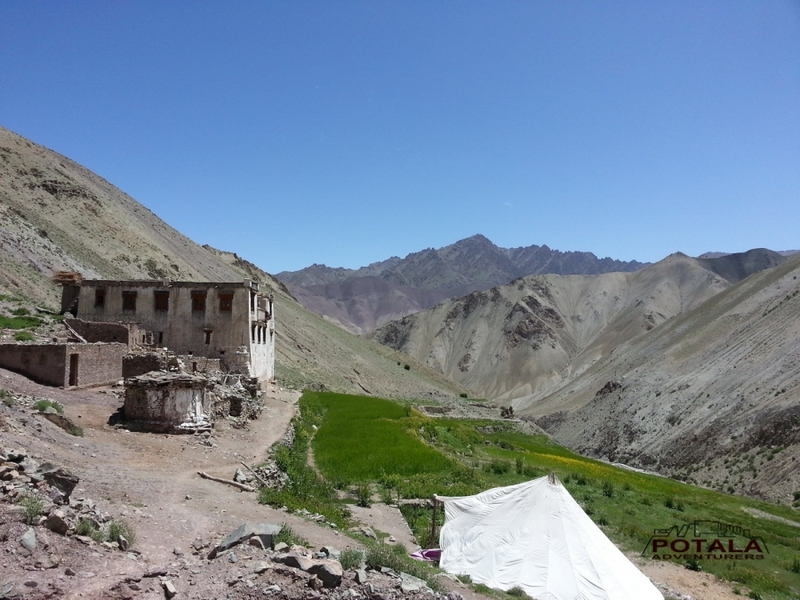 We are in main Markha valley. At a short distance beyond Skiu our campsite. 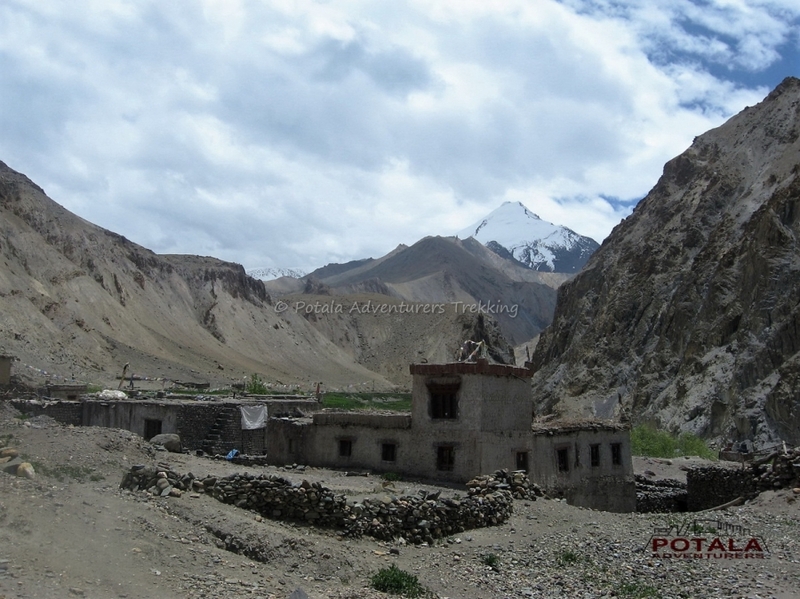 We pass the small village of Chokdo and continue along the stream to village of Shang Sumdo. 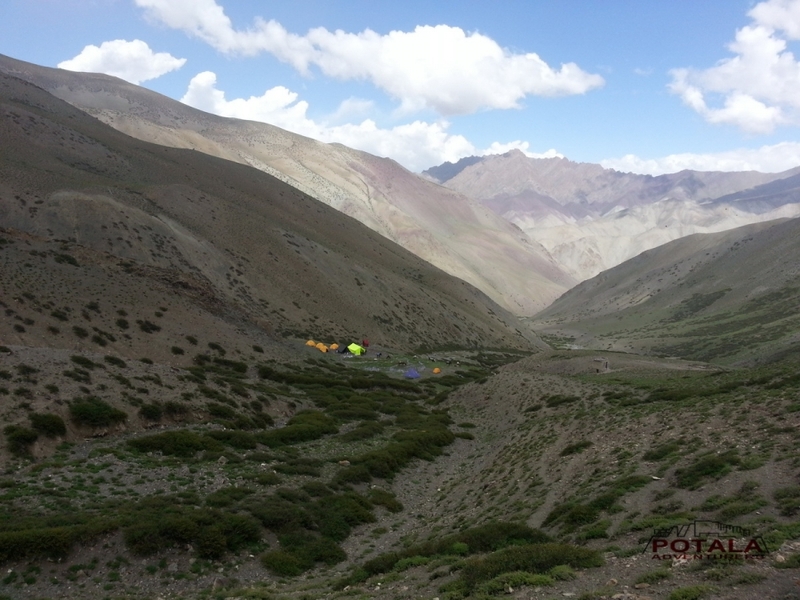 leaving Shang Sumdo, we say adieu to our horseman and drive to Leh, at first visiting Hemis. 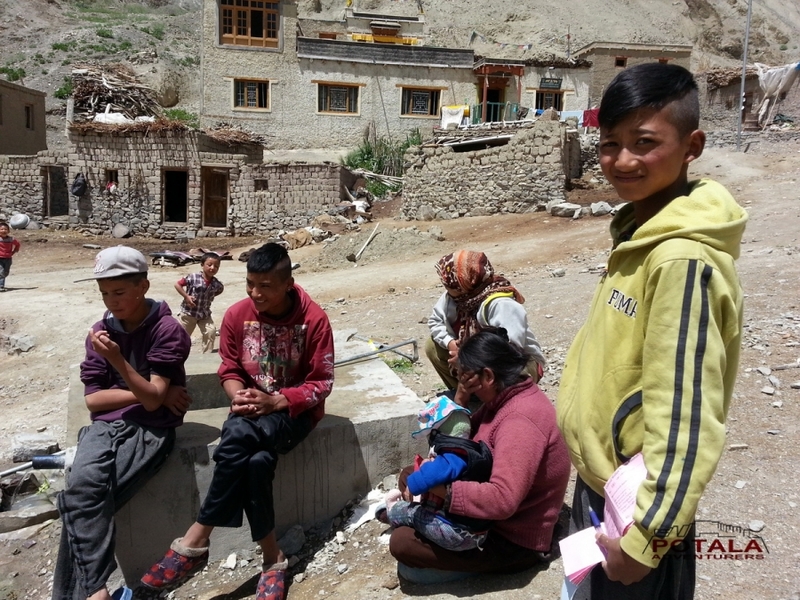 We drive along the valley to Martselang and take road to Hemis, which is hidden in mountains. 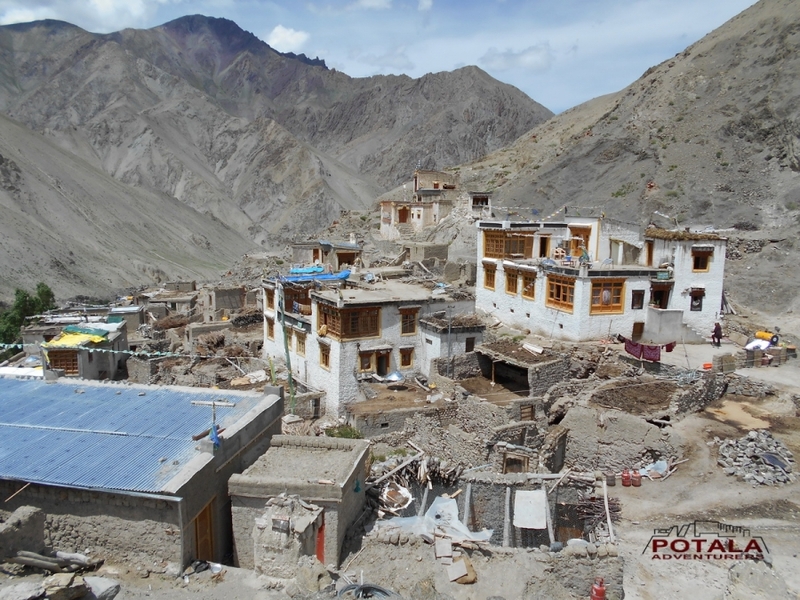 Hemis is located 45 kms south of Leh. Exploring this ancient monastic complex continue to drive to next stop which is Thiksey, located on a hill and most picturesque sight in Indus valley. 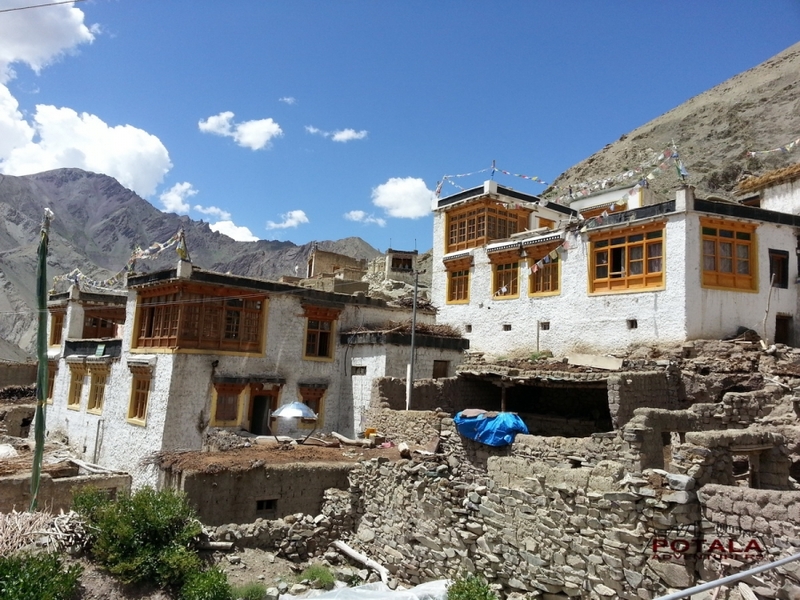 Finally to Shey palace before heading off to Leh. Overnight in Hotel. ü 7 nights camp with all camping facilities. 3 men spacious 4 season tents for 2, sleeping bags, foam mattresses, dining tent, trekking poles & safety gears. 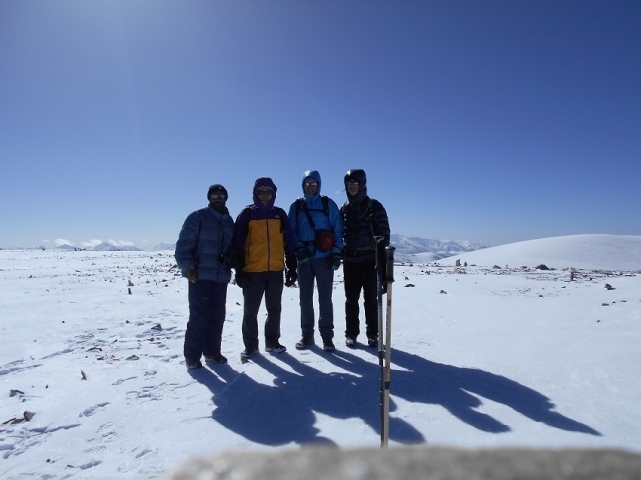 "Our experience has been truly a memorable one. 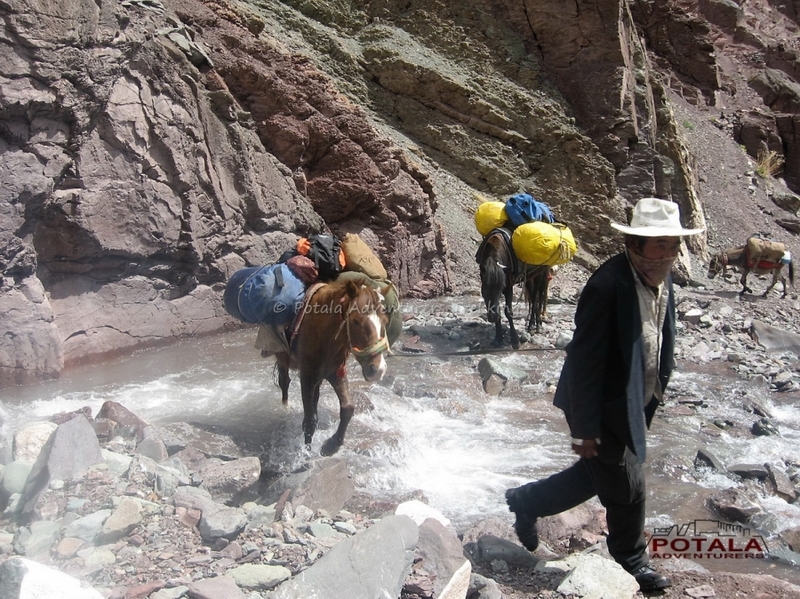 The scenery has been an incredible, the interactions with other travelers most enjoyable, and the service provided by our guide, cook and pony men were exceptional. Our guide, has been without a doubt, the most accommodating and helpful in every way; our cook created fresh culinary masterpiece each day (include a surprise anniversary cake); and our pony man, was most gracious in every way. 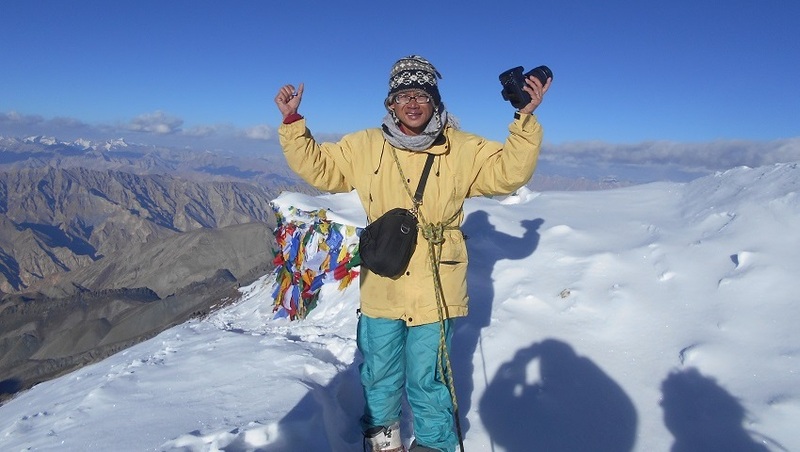 We highly recommend Potala Adventures to all world travelers." 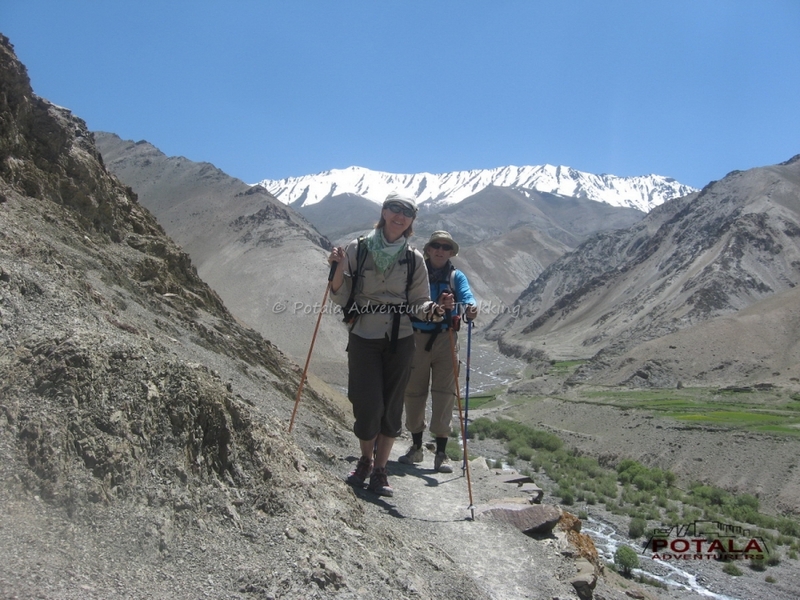 Day 1 Fly Delhi (230m)- Leh (3500m), acclimatise day 1, visit local market, Shanti Stupa, Samkar, Leh palace. Today morning early transfer or drive to domestic airport for the flight to Leh, but spectacular flight over the Himalaya to Leh. 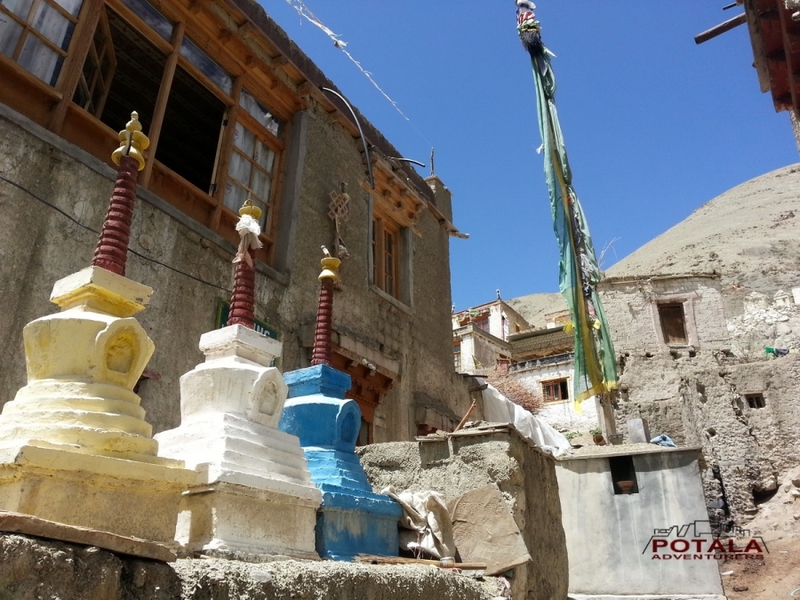 The rest of the day is free to relax and acclimatize to the altitude of 3500m as well as visit Leh palace, Tsemo gompa, Sankar and Shanti stupa. 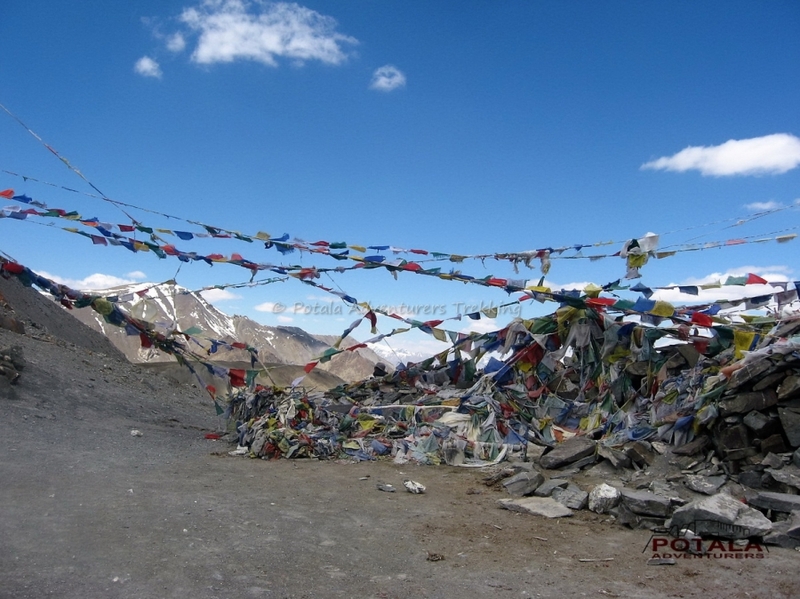 Day 3 Drive Leh – Spituk - Zingchen (3530m), Trek to Yurutse (4200m) via Rumbak (4050m), 5 - 6 hrs. 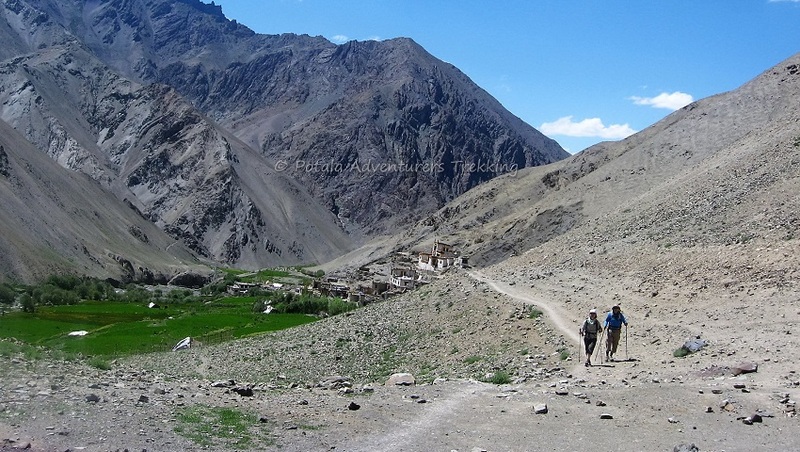 Leaving Leh today after breakfast drive to Spituk which is 7 kms and has a Gelukpa sect monastery built on a hill and has a magnificent view of Indus valley, continue to drive to starting point of trekking, where our mules and horses will be waiting for us. 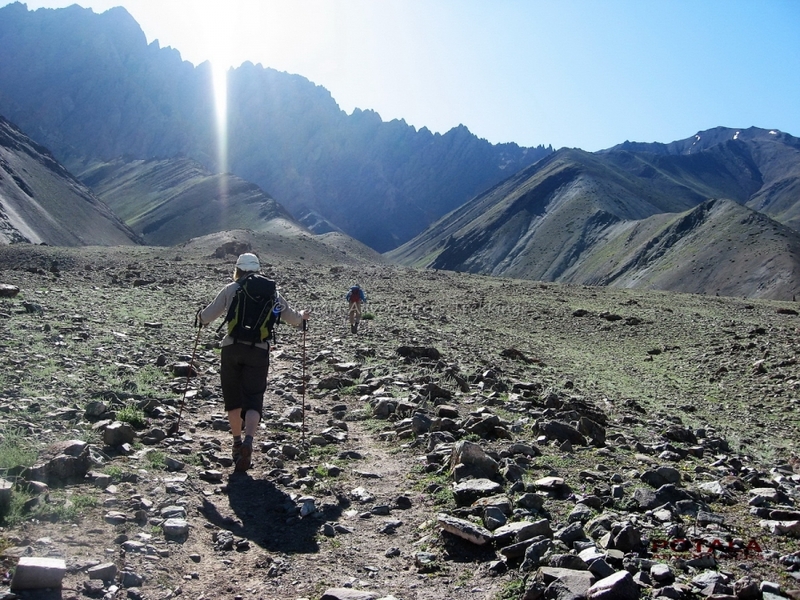 Staff will load luggage as you continue to trek on a clear path. 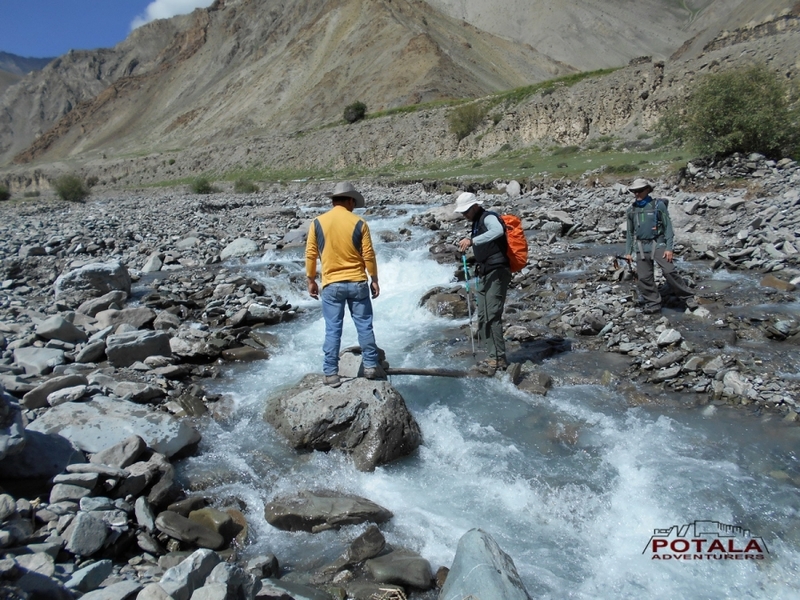 Now easy and gentle walk south west of Indus River until the confluence of Zingchen and Indus. 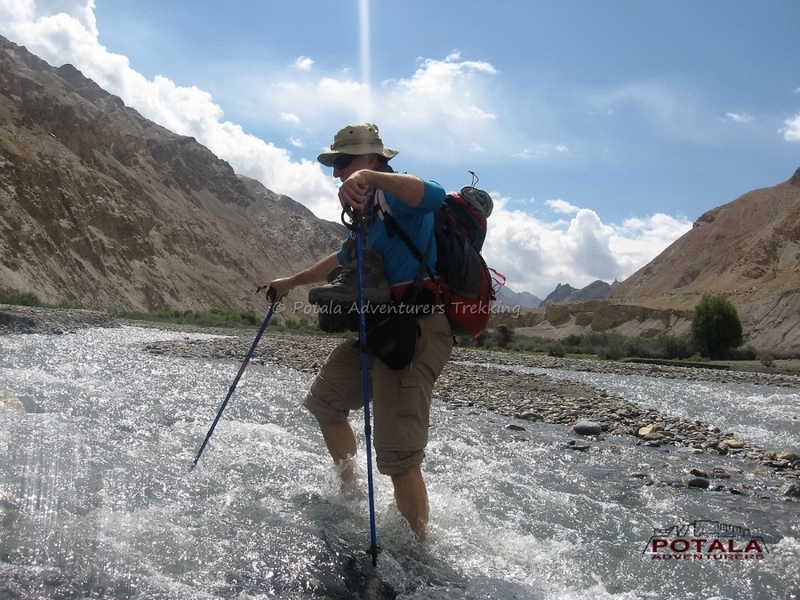 Leaving the main Indus valley and traversing to the left valley upstream along the small river to Zingchen. Ggradual climb to Rumbak on a well-defined trail. 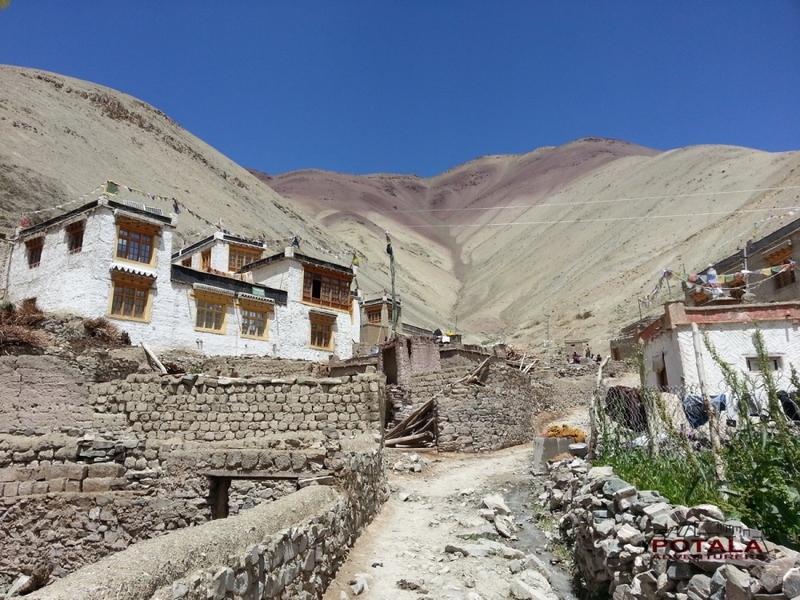 We pass Rumbak village. 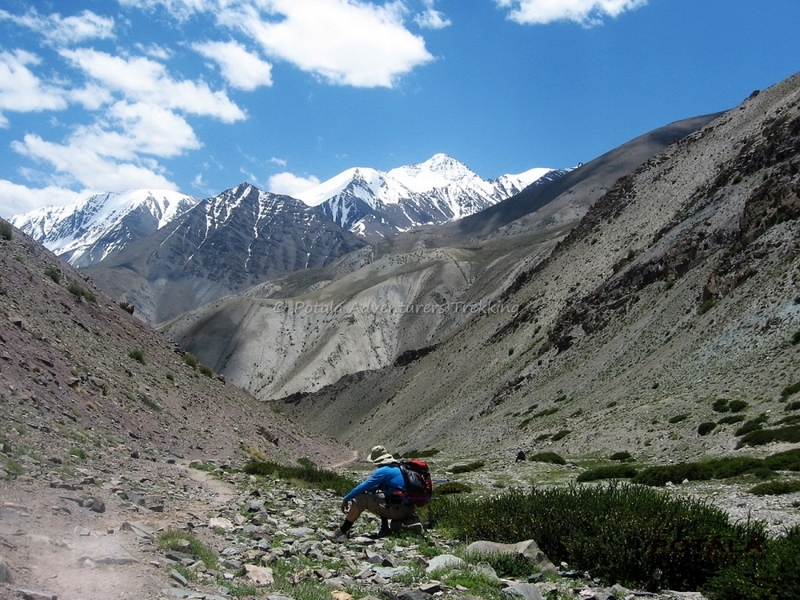 A fabulous view of snow-capped Stok Kangri can be seen. 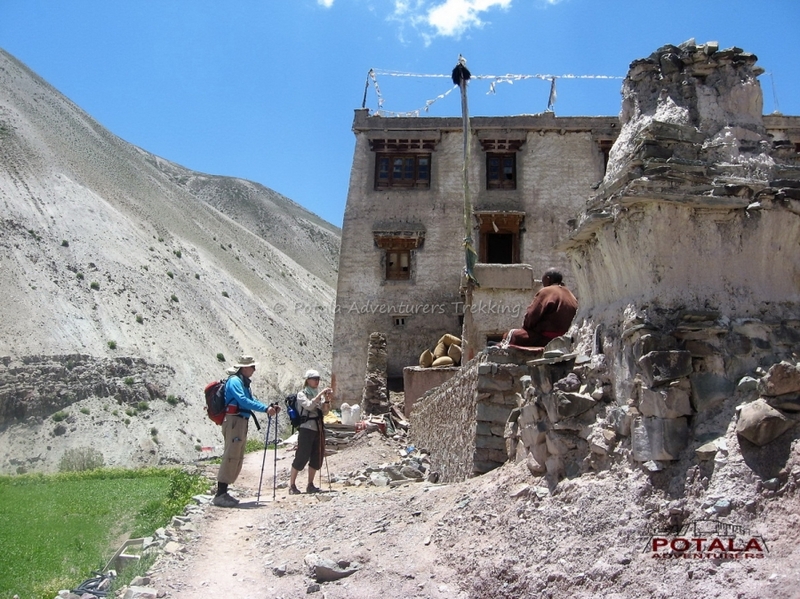 Now we move towards the Rumbak nallah, crossing it walk along the right side leading towards Yurutse. 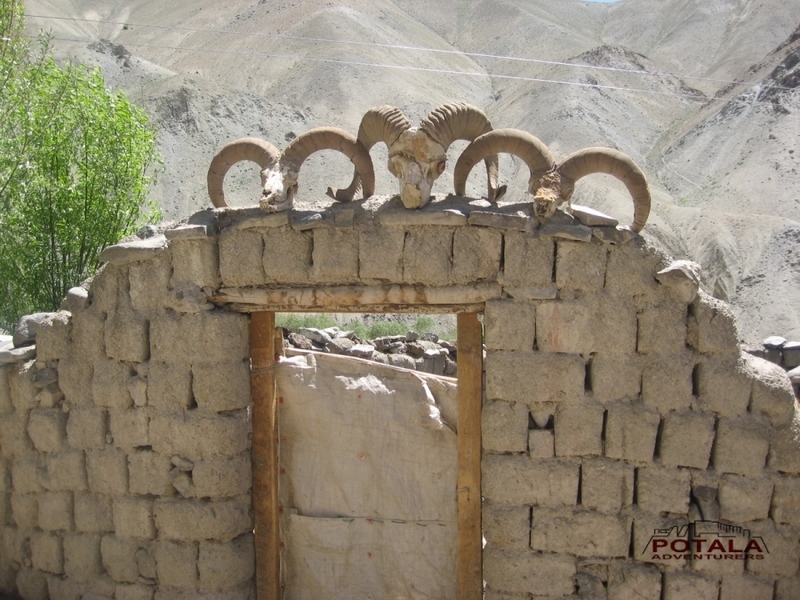 Yurutse has only one house and has a fields of vegetables and barley crop. Overnight in camp. 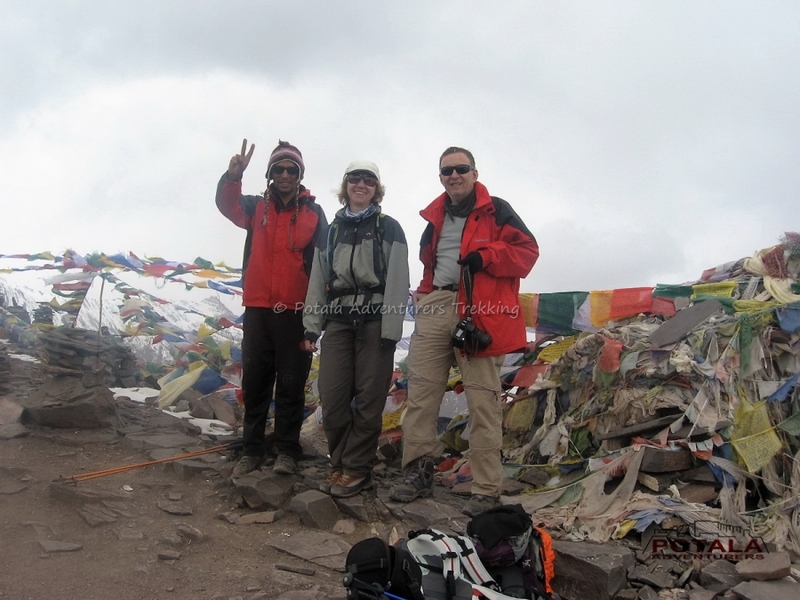 Day 4 Trek to Gandha la (4900m) – Shingo (4060m) – Skiu (3290m). 5 - 6 hrs. 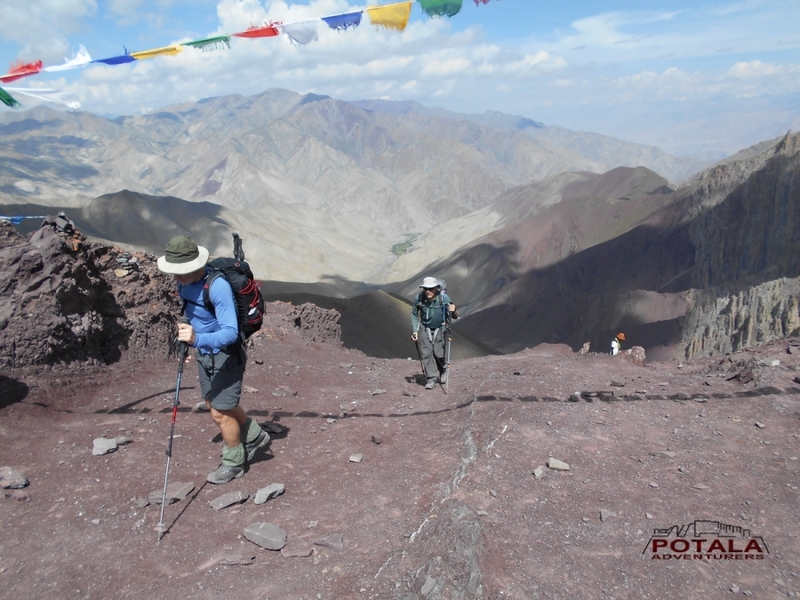 Gradual ascent to base of pass 4500m and then steep climb to Ganda la pass 4900m. 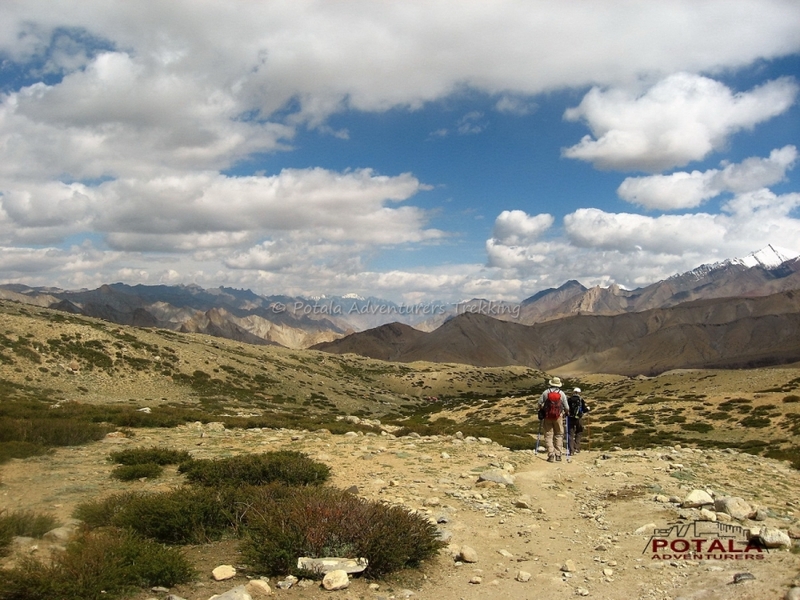 The views from top Zanskar range to the south and Ladakh range to the north and Karakoram beyond Ladakh range. Soon after long descent to Shingo 4060m and then on a narrow and stunning gorge leading towards Skiu and the valley opens out. 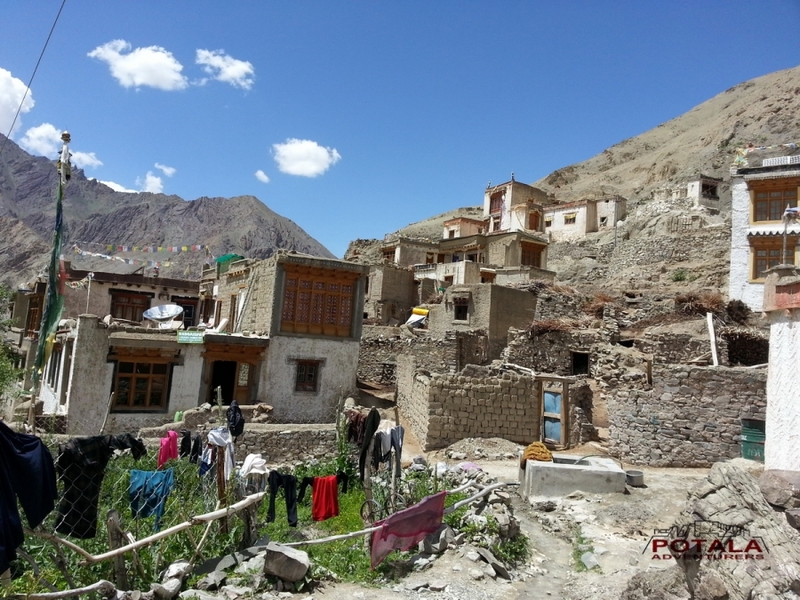 We are in main Markha valley. At a short distance beyond Skiu our campsite.Overnight in camp. 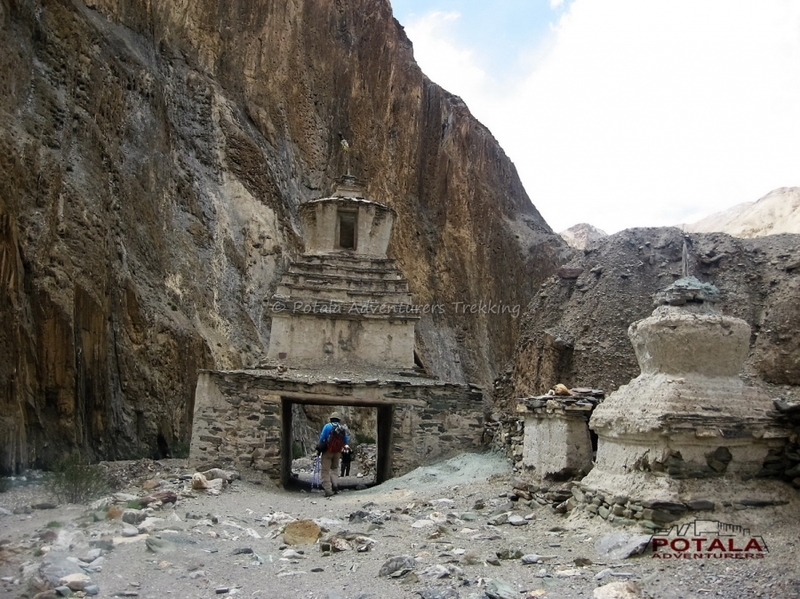 Day 9 Trek to Shang Sumdo (3660m), Drive to Hemis, Thiksey – Shey - Stok - Leh. 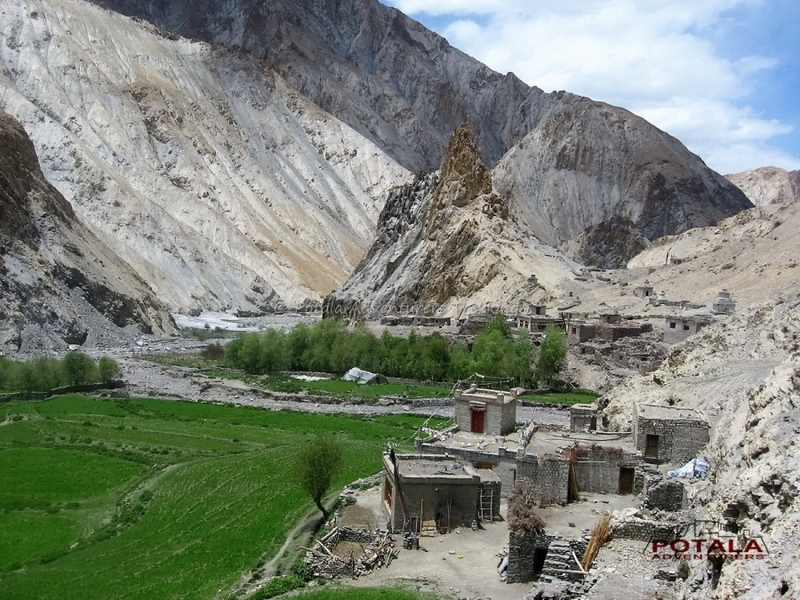 We pass the small village of Chokdo and continue along the stream to village of Shang Sumdo. 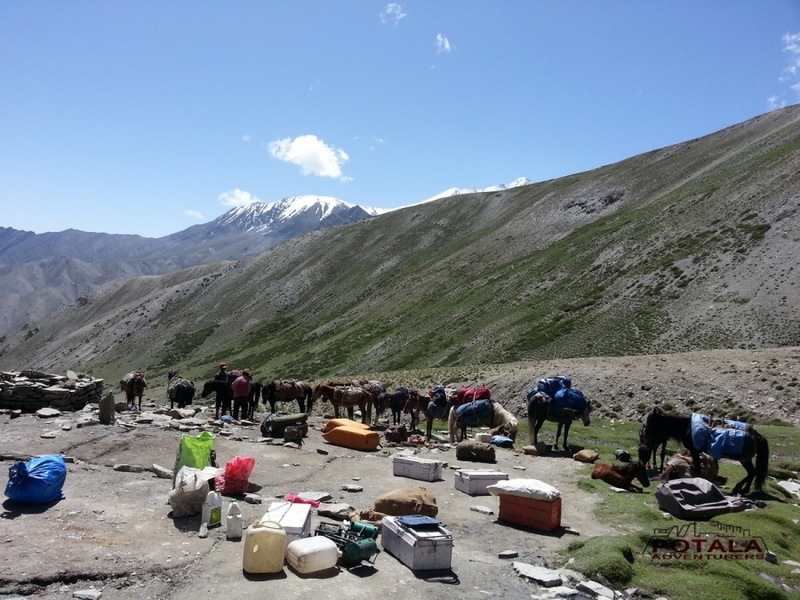 leaving Shang Sumdo, we say adieu to our horseman and drive to Leh, at first visiting Hemis. 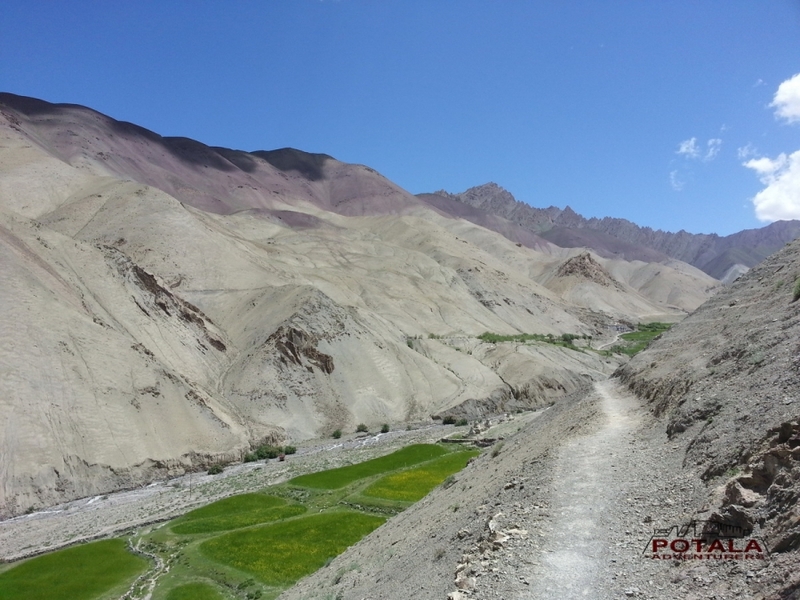 We drive along the valley to Martselang and take road to Hemis, which is hidden in mountains. 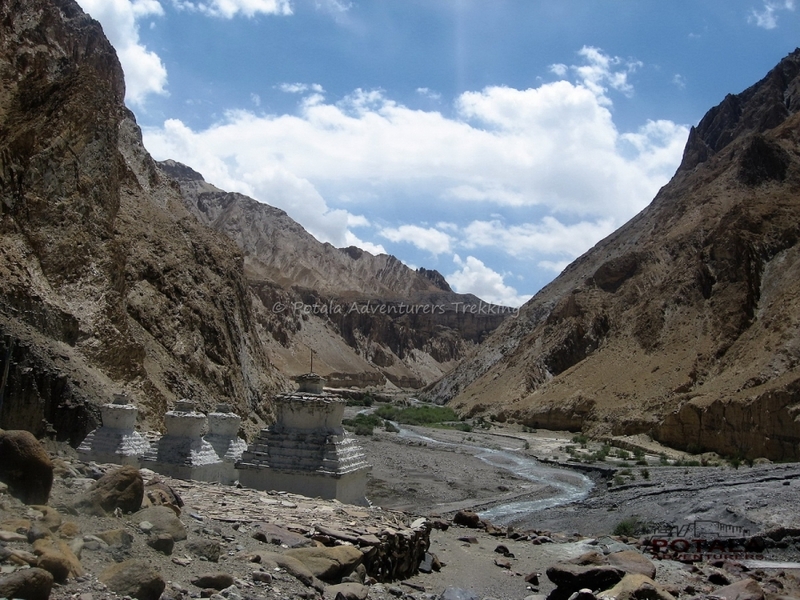 Hemis is located 45 kms south of Leh. Exploring this ancient monastic complex continue to drive to next stop which is Thiksey, located on a hill and most picturesque sight in Indus valley. Finally to Shey palace before heading off to Leh.Overnight in Hotel. Today relax and explore local bazar. Day 11 Flight Leh - Delhi. Early breakfast at hotel and drive to airport for return flight to Delhi. Arrival at Delhi and overnight stay in hotel close to International airport and fly home. × Hotel in Leh, Delhi. × Personal tipping to staff: Guide, cook, helper, horseman, driver. × Any unforeseen cost arises by natural hazards rain, snow, road block which cost extra lodging & boarding beyond trip Schedule.